A Harris poll late in 2015 showed that over half the millennials in the U.S. would consider leaving the United States for a foreign country according to CNBC. We think this is an incredible change for Americans since a few years ago. We remember a time when almost no American would ever consider leaving the U.S. Obviously that has changed. Our son went to work for an international company, became fluent in Spanish, and beginning perhaps 15 years ago he started calling telling us we should consider living in Latin America. We thought the boy had lost his mind. WHO, we wondered, would ever trade living in the most wonderful country in the world for some backwater South American country as visions of dirt floors and bamboo shacks loomed in our imagination. But . . . that was years ago. Today many are considering making the same change. Not necessarily for fear of the goings on in the United States, though we think that could be reason enough, but partly because they see opportunity in other parts of the world. Several financial analysts now are saying that there is going to be a great wave of people leaving their own country to set up their lives elsewhere. What a change! Probably surveys like this one fuel that idea. We are noticing changes in the attitudes in our area about immigration. Sometimes it is not easy to keep up with the changes. Not long ago we knew expats who were filing for citizenship early in their second year. One expat reported getting her citizenship actually 18 months after her arrival, several months short of two years. We think that was rare then, and may have been a mistake on the part of some court clerk, but in any event, that does not happen anymore. People are reporting to us that they are not allowed to file until the two years in Argentina are up, not before. At one time we knew expats who had lived in Argentina as illegals for many years. They just came and never left. They had no problems from the authorities. Now the local publicity is that Argentina is cracking down on that. Another example is Uruguay. At one time their immigration practices were very accommodating. These days we think they are getting very radical about applicants intending to live in Uruguay. We know one man who was told by Uruguay immigrations that his permanent residency had come through and his representative could pick up the paperwork. So he went to the U.S. to arrange for shipment of personal goods and, because he had left the country, they disallowed the residency. It is a long story of how that worked out but he was so disgusted with Uruguay over it he decided to drop the residency and go to Chile. Incidentally, we keep seeing it published in expat publications and web sites that Uruguay is inexpensive. That information was true perhaps eight years ago. We were amazed by what some expats bought houses for within walking distance of the beach. However, the values of those homes nearly doubled over the next few years and Uruguay was no longer cheap. If you are a senior citizen in the United States, in Florida, and you go to Golden Corral for a sumptuous buffet you can do that for $8.00. In Uruguay if you go to the Tenedor Libre, a buffet in Montevideo without nearly the choices of Golden Corral, it will cost you more than $20.00. Utilities are very high as well. But when that information was first published, it was true. Sadly it is still being published though that time has passed and people come to Uruguay expecting it to be cheap and they are disappointed. Well maybe it is cheap if you are coming from California–from what we hear–but not otherwise. Having said all that, most of you know by now that there is quite a crisis in the commodities market. That crisis is being felt in South America and we think will only become more severe in this downturn. Prices in Uruguay are beginning to drop slightly. 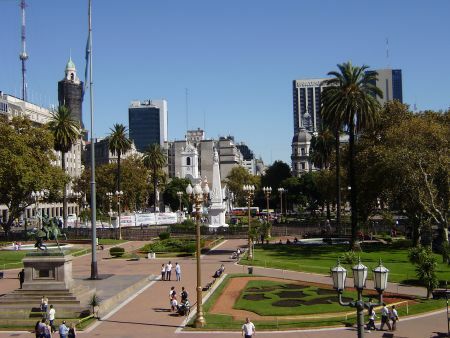 We think that buying opportunities are ahead in the entire southern cone for those who are interested. We can’t prognosticate about when it will happen. Nothing goes straight down and patience often pays. For our Middle East subscribers we are sad to report that, alhtough this is not officially published, we cannot help anyone from that part of the world to emigrate to the countries in the south of South America unless they have a sponsor within the country. Even with a student visa they must have a sponsor. Our message is that things change. Every country here has raised the bar for entry in one way or another since we arrived and we believe that, as more and more people seek to establish themselves in our part of the world, it is going to become harder to do so. We believe that it has been the large influx of newcomers in Uruguay that has pushed up prices, at least in part. So whatever you are reading, either here or elsewhere, if it is very old at all, there is a good chance things have changed. And if the waves of applicants here increases at the rate that surveys like this indicate, who is to say that it will even still be possible. However, we don’t expect that to happen any time soon. But we can see how it could. For those who are are clear about what they want to do, and it includes planting a flag in our area, we think that sooner may be a lot better than later. Now is the time for wise decisions on an individual basis, but not for procrastination.